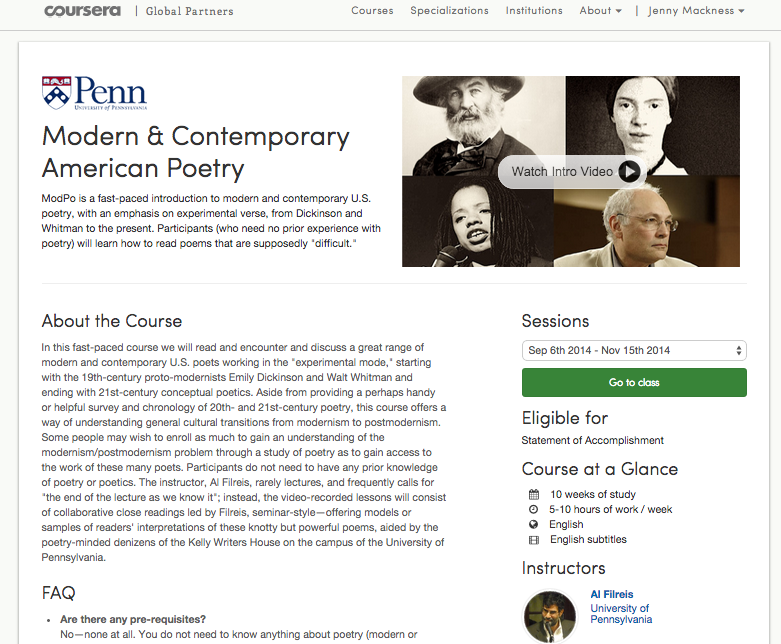 One of the things I appreciate about ModPo (the University of Pennsylvania’s Modern and Contemporary American Poetry MOOC ) is that whilst the essential syllabus remains the same from year to year (or has done so far and it is a very extensive syllabus), there are changes to the ‘course’ each year (course in inverted commas for reasons which will become clear below). This year there are two significant changes. There’s an additional ModPo Plus section. ModPo has a lot of participants who keep returning. This is the second time for me, but some participants are back for the third time. The ModPo Plus section introduces new poems for each week (in a separate section of the syllabus) and encourages people who need to/want to, to move on. I see this as supported differentiation within a MOOC! A section has been created especially for teachers. The ModPo team realizes that lots of teachers attend the course looking for ideas on how best to teach poetry in their classrooms. They have developed this area of the course to highlight resources that relate to teaching, to share lesson plans and teaching strategies and to facilitate discussion and interaction between teachers. This must be incredibly helpful to teachers who teach poetry. Within the teaching resource section, I have watched two videos. I don’t teach poetry, but I have found both these videos interesting and helpful in relation to my own work as an independent researcher of open, emergent learning environments. What I liked about the discussion about close reading was the emphasis on the need to slow down. Close reading cannot be done quickly – unless you are a 600 word a minute person and I do know someone who can do this – and I am so envious! But for someone like me, it is good to have confirmation that for most people meaning making and understanding requires slow reading. The ModPo team in this discussion shared strategies they use for close reading with groups of students, strategies such as reading aloud, repeating lines, reading backwards, selecting and mapping key words, assigning lines to different students, creating false dichotomies/binarisms on interpretations and so on. These are strategies that can be used on any text. As Julia Bloch (the lead teaching assistant) said – ‘You can close read a cereal packet’. I know someone who after having done ModPo decided to close read an assignment question with his students – to help prepare them for writing it. I can see that this could be very helpful. Anyone who has set student assignments will know how difficult they can find it simply to read and understand the question. Al Filreis’ rationale for close reading is that it disperses interpretative responsibility amongst the group – it is more democratic, but also harder than listening to a lecture. The focus in ModPo is on the process rather than the content, although there is plenty of content. This was an interesting discussion in which the team discussed their understanding of xMOOCs, cMOOCs, connectivism and where ModPo sits in relation to these. Dave Poplar, one of the teaching assistants, did a good job of sharing his knowledge and understanding of xMOOCs, cMOOCs and connectivism. He pointed out that ModPo is technically not a cMOOC because in a cMOOC the syllabus is not centralized. What is a cMOOC? This was how Dave Poplar answered the question. A cMOOC is a connectivist MOOC, structurally created to enable connectivism. (See Stephen Downes’ and George Siemens’ blogs for more information.) This approach recognizes that society has changed. We are confronted with a chaos of information. Knowledge can no longer be possessed by HE institutions and transferred, but is instead the process of forming connections. A cMOOC uses the global communications network to distribute the whole concept of the authority of knowledge and make it accessible to all. In cMOOCs the students drive the direction of the course. Needless to say this approach to teaching and learning can pose a threat to HE institutions who are committed to the idea that they are the authority, they distribute knowledge and students pay for this. It therefore suited many of them when some platform builders, such as Coursera, Udacity and the like, came along and offered the possibility of taking existing courses and distributing them to huge numbers of people (the massive in MOOC). These then became known as xMOOCs. xMOOCs took the traditional approach to teaching and learning and put it online. Unlike cMOOCs, in xMOOCs there is nothing inherently different to the traditional approach to education. ModPo doesn’t think of itself as either an xMOOC or a cMOOC. Although it uses the Coursera platform, it doesn’t believe that this platform is inherently a regressive pedagogy – there is nothing inherently lecture dependent about the platform. ModPo believes it is as connectivist as an xMOOC can get. My experience of ModPo would support this. The ModPo team do not believe that they offer a course or a text book. Instead they offer a set of resources, synchronously once a year for 10 weeks, including links to a huge number of open resources. They have nurtured a dynamic community which helps with the curation of these resources. It is not ModPo’s intention to replace existing courses. They believe that the most powerful learning in this dynamic environment can be experienced in the discussion forums and through the live webcasts. For them the advantage of the forums is that the discussion cannot be controlled or predicted. Close reading of poetry is an open activity which requires the collective intelligence of lots of people and in ModPo this is the collective intelligence of a global community of lovers of poetry. Excellent review. Thanks. I’ve never seen an xMOOC add material for repeating students, create a section for teachers, or discuss differences between xMOOCs and cMOOCs. Modern Poetry was not a course I was likely to sign up for, but now I’m eager to try it sometime.